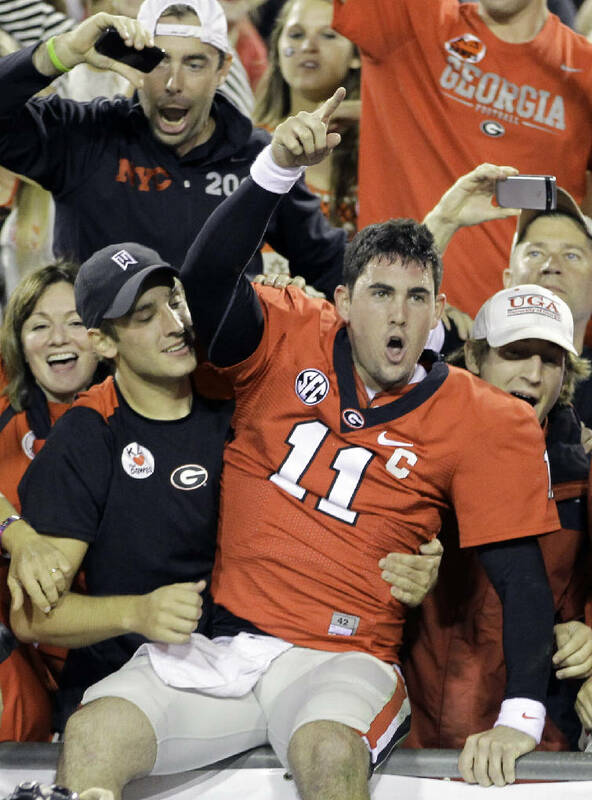 Georgia quarterback Aaron Murray celebrates with Bulldogs fans following Saturday's 17-9 upset of previously undefeated Florida. ATHENS, Ga. -- Georgia's victory list over top-three opponents since World War II is not a long one. The Bulldogs rallied past No. 2 Texas in the Cotton Bowl after the 1983 season, stunned No. 2 Clemson in '84 and routed No. 1 Florida in '85. They dumped No. 3 LSU in the 2005 SEC title game and notched a fifth such triumph last Saturday with a 17-9 topping of No. 3 Florida. With these victories so rare, it's no surprise that latest one has become the favorite among Georgia's players. Senior receiver Tavarres King dropped a pass and senior inside linebacker Christian Robinson was in for less than half the plays, but that didn't matter. "That would definitely be the top thus far, but hopefully we can get another one," Robinson said. "When you play in big games, you feel like you play more. When you're making plays and helping them get off the field, you definitely feel a part of it." Said King: "Our defense played lights out, and it was just a fun game to watch. I only sat down twice during the game because the defense was tearing them up, and I just wanted to see it." Senior cornerback Sanders Commings said this year's win over Florida replaced last year's win over Florida as his favorite, and junior quarterback Aaron Murray threw three interceptions but called it "the biggest win I've ever been a part of since I've been here." Bulldogs junior outside linebacker Jarvis Jones is the top prospect for the 2013 NFL draft according to longtime analyst Mel Kiper. It has long been expected that this would be Jones' final college season, and teammates already are talking about his absence and how it will affect next year. "We're getting those big plays out of Jarvis, and we're going to need a guy next year that's going to deliver those same big plays," sophomore cornerback Damian Swann said. The top three storylines from Georgia's victory in Jacksonville were Jones, the nine combined turnovers and the 24 combined penalties. A bit under the radar was Bulldogs freshman tailback Todd Gurley, who carried 27 times for 118 yards and a touchdown. "I thought it was probably underrated as far as what people talked about," Georgia coach Mark Richt said. "It was a tremendous performance, to have that many carries against that physical of a defense. He averaged 4.4 and didn't really have a long run. That was a heck of a game, and his ball security was tremendous." Gurley is now third among SEC rushers with 92.5 yards a game, trailing Texas A&M quarterback Johnny Manziel (99.1) and Mississippi State tailback LaDarius Perkins (95.2). Ole Miss, this week's opponent, is a surprising 5-3 this year and has given No. 1 Alabama its toughest game (33-14). The aberration to the Rebels' turnaround occurred Sept. 15, when they lost 66-31 to visiting Texas and surrendered a staggering 676 yards. "That game was so long ago that it's not the same Ole Miss defense, in my opinion," Richt said. "There are some things you might learn as far as some things schematically that they did, but they didn't play that day like they're playing now defensively." The Rebels rank ninth in the SEC in total defense (allowing 369.5 yards a game), one spot behind Georgia (354.8). The Bulldogs hold a 31-12-1 series lead over Ole Miss and have won nine straight, Georgia's longest active winning streak against an SEC foe. ... Offensive coordinator Mike Bobo said after Tuesday's practice that sophomore Watts Dantzler from Dalton did not practice well enough last week to be among the 10 linemen who traveled to Jacksonville. ... Richt on Jones: "I think he's the best player in America." ... The Bulldogs have a top-10 defense in this aspect: Georgia ranks ninth nationally with 4.88 three-and-outs a game. ... Ole Miss coach Hugh Freeze on Richt: "You kind of find yourself pulling for him when you're not playing him."